Why The Australian Film Industry Needs Private Investment? When someone asks me what my favourite Australian film is, my mind goes blank. I’ve seen a few Australian films over the years, but to be honest, nothing has ever stuck with me. I feel bad about it sometimes, considering I should technically be supporting the industry that I’d like to be a part of. But can you name your top 10 favourite Australian films? And how do they honestly stack up against your favourites of all time? Economically speaking, Australia’s seen massive uninterrupted growth over the last few decades. We’re one of the wealthiest countries in the world. Just last year, Australia took over Switzerland as being the country with the highest median wealth per adult, according to the Credit Suisse 2018 Global Report. Given the strong accumulation of Australia’s wealth over this same period, you have to wonder why the Australian film industry hasn’t followed suit, never producing more than 42 films in a single year, as shown above in 1985/86 and 2009/2010. 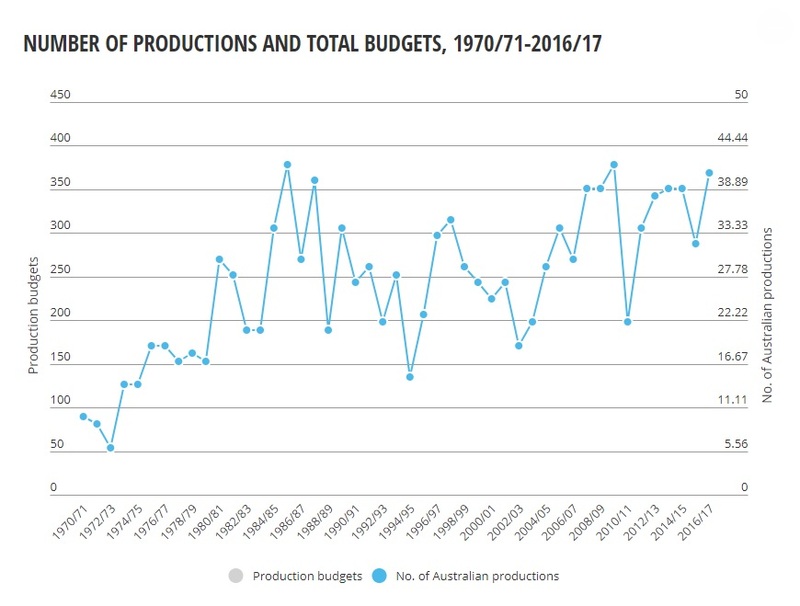 It’s important to note that this graph defines Australian productions as “productions under Australian creative control, including domestic productions, official co-productions and other productions involving shared creative control, i.e. with a mix of Australians in key creative positions.” So technically, this includes mega studio films like Peter Rabbit and Mad Max: Fury Road, which secured a majority of funding from major American studios or other sources of international funding with budgets of $50+ million, and whilst being filmed here, are stories set in other countries or worlds. Cinema builds culture. It seems short-sighted that the government doesn’t value the link between strong tourism and a healthy culture of art. New York and Paris are two of the most romanticised cities in film history — it’s the artists who create the cultural identity for the rest of the world to see. A large problem with the foreign investment model is that these films don’t happen all that often. Yes, they bring in a whopping amount of cash when they do, but they’re generally driven by the strength (or weakness) of the Australian dollar, and because it’s usually spent on below-the-line costs and crew, it doesn’t create a lot of opportunity for Australian-owned production companies and studios to grow and build a self-sufficient industry in the long term. I’ve been doing a bit of research to understand how films have been financed over the last few decades in Australia, and it seems like a major turning point in the Australian film industry was the introduction (and eventual demise) of the 10BA tax incentive. Up until the 1980s, feature films were predominantly financed through the government, most notably the Australian Film Commission (AFC), established by the Whitlam Government in 1975. There was a strong push at the time to build upon Australia’s output of cultural content. This was followed by the 10BA tax incentive – introduced by the Fraser Government in 1981 – which allowed investors to claim a 150 per cent tax concession and to pay tax on only half of any profit earned. Private investment soared. So did the amount of productions being made. According to Screen Australia, during the years 10BA was at its most fruitful for investors, the 10BA incentive accounted for 92% of all Australian productions. Feature films were being financed by a wide variety of investors with deep-pockets, including cinema proprietors like Hoyts Edgely and Greater Union. The main condition was that the production had to have ‘substantial Australian content’. This production boom led to films such as Malcolm, Mad Max 2, Burke & Wills, Phar Lap, Silver City and Crocodile Dundee, which to this day is still Australia’s highest grossing film of all time. According to Screen Australia, “the audience share for Australian cinema during 10BA‘s subsidy was the highest in post-war history.” Australians were seeing more variety in the domestic stories that were being told – they had more choices. It also led to investment in location and post-production facilities around the country. Unfortunately, eventually cases of tax evasion and arbitration would cause the Hawke government to grow weary of their own investment and long term expenditure of the subsidy, and due to a risk-averse mindset, over the next few years the incentive was gradually whittled away, so investors could then only claim a 100 per cent tax concession and had to pay tax on all income earned. This halted private investment immediately. So now, governments would only partially fund projects on the condition that they also get a piece of the pie. Films were still made, due to the FFC and local government funding bodies (New South Wales Film Commission, etc. ), but the amount of productions dipped dramatically, as did the audience share. Do you remember that second spike in the graph from before? That spike in productions was the result of the announcement of the 10BA incentive being discontinued altogether in 2007, which led to a spur of last-minute investments. The FFC, under the new Rudd government, would become the government funding entity known as Screen Australia, and the 10BA incentive would be replaced by the current funding model, the 40% Producer Offset, and the 16.5% Location Offset. To qualify for the Producer Offset a film must be an ‘approved offical co-production‘ or ‘meet the ‘significant Australian content’ (SAC) test if not a co-production’. When considering the SAC content. It also must satisfy a Qualifying Australian Production Expenditure (QAPE) threshold of at least $500,000. This means that at least $500,000 of the budget must be spent on Australian crew, goods and services. The Producer Offset entitles the production to a 40% rebate of said QAPE. Since the Coalition took power in 2013, there has been no inquiry or government review into the practices of Screen Australia. $51.1 million in government funding to Screen Australia has also been stripped back over the last four years. Over the 5 years from 2013/14 to 2017/18 there was an average 35% total Australian expenditure on Foreign Features and TV Dramas. This peaked in 2016/17 with 48% of total Australian Film Industry expenditure telling foreign stories. Over the years Australia has been attempting to boost their economy by attracting Hollywood and other large foreign productions to be filmed in Australia, for example, providing $47.25 million to Thor: Ragnarok and a Ridley Scott film. Thor injected an estimated $142 million into the Australian economy and provided 1000 temporary jobs to Queenslanders. These are short-term economy boosters, but they aren’t long term investments to build a consistent domestic industry. They also come at the cost of not funding smaller productions, which might be less of a sure thing in terms of budget recoupment, but have the chance to actually tell authentic and diverse Australian stories. In other words, for a domestic film industry desperately reliant on government assistance to produce Australian stories, it’s not looking good. Here’s hoping that with a new government, a review will be taken into the policies around the film industry, and that more opportunities can be given to young creatives like myself. Give us the chance to succeed and fail, without letting us fall into lifetimes of debt. It probably won’t happen overnight, nor without a significant push from the Australian public. We have to make Australians care about Australian cinema again. We have to get the government to care about Australian cinema again, and once again make it appealing for private investors. It sounds selfish, I know, but the more diverse and niche stories that get told, the more empowered we will all become as storytellers. We will be able to tell our stories. And that will have cultural and historical ramifications unlike anything this country has ever seen. One day we might even outgross Crocodile Dundee.